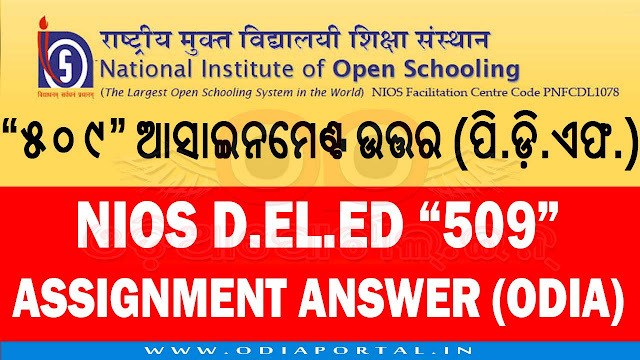 The following is the answer paper or note for NIOS D.El.Ed. (C.T.) for in-service teachers of Odisha who were enrolled in NIOS Platform last year. If you are a teacher and going to prepare and submit Assignment for course number 509, here is the right place for your need. You can download D.El.Ed (C.T) Odia Assignment Paper (509) for free in PDF below. Just click on below button and save the PDF to your Computer / Smartphone. Note: Answer the following questions in about 500 words. Note: Answer the following question in about 1000 words. Explain the concept of Continuous and comprehensive evaluation (CCE). How will you use CCE for your learner in social science? Explain through examples based on your experiences. PLEASE NOTE: This Assignment Answer only available on our "Odia Question Bank" Android App for Free.